Coming up … Stay tuned! 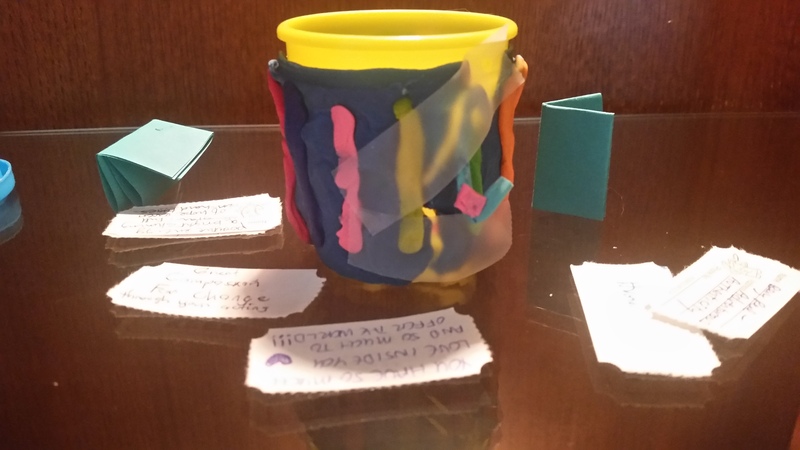 We had a wonderful time presenting a workshop at the Ambler Library on November 13, 2018! Looking forward to coming back in the spring of 2019! A special heart-felt thank you to everyone who came out for these events! We really appreciate your participation and your support! FREE TO THE PUBLIC– 6:30PM (refreshments at 6:15) — JUST CALL THE LIBRARY TO RESERVE YOUR SPACE! 215.646.1072. Click HERE for the address and directions. Research shows that directing our attention to what is positive in ourselves and others is essential to maintaining well-being, building resilience, and gaining perspective. This is often easier said than done. In this workshop, we’ll have some fun – meet new humans – and use our creativity (and our Playdough) to design our very own buckets. We’ll explore some findings from the fields of positive psychology and mindfulness, and we’ll learn some concrete ways to fill our buckets. You’ll leave with a full bucket – and a full heart. I still have my personal bucket that I created during a similar exercise two years ago. It is held together with scotch tape and looking rather ratty; I still find it uplifting to read the notes inside whenever I need a boost. Mindfulness Meditation – Summer Circles – LAST ONE FOR THE SUMMER – Saturday, August 25 at 10:00 am. Thinking about starting a Mindfulness Meditation practice? Want to understand what Mindfulness is all about? We are encouraging and serving people who are new to mindfulness, meditation – or both. Of course, experienced humans are welcome! Know that we will be covering preliminary and introductory concepts. Mindfulness meditation offers many proven benefits. A regular practice improves emotional stability and physical wellbeing on a variety of measures. More to the point, this practice helps you slow down – pause – and stay present. THIS IS YOUR LIFE – BE PRESENT FOR IT. ∞ Investment: I would do this for free if I could – and maybe someday I will be able to do that… it is my dream. For now, to keep our doors open we are asking $12 for a session. Students 18-25 and those who are Young at Heart (62+) are $10 for a single session. Feeling crunched? Donate as you are able. We accept cash or checks at the space; Paypal or Square coming soon! 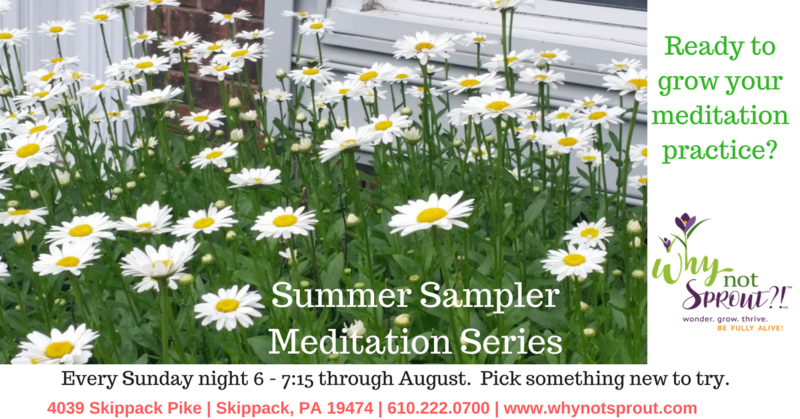 Final Summer Sampler Meditation: Restorative – Sunday, August 26 at 6 pm. Offered every Sunday evening through August. You can join us for one meditation – or join us for as many as you want… the choice is yours! This type of class is likely very different from what you have come to associate with yoga. You will spend the entire time seated or lying down – no mats, no standing, no balancing, no flowing from pose to pose. Your body will be fully supported with blankets, bolsters, pillows, cushions and foam blocks so that your muscles are able to fully release any tension you have accumulated, allowing you to wind down and open up mentally and physically. You will feel held, nurtured, and safe. Guided meditation will be interwoven to further enhance the experience. The quiet nature, deep breathing and calming postures of restorative yoga gives your whole being permission to relax deeply, bringing your central nervous system back into balance with a sense of healing and recuperation. This is not intended to be a full restorative yoga class. 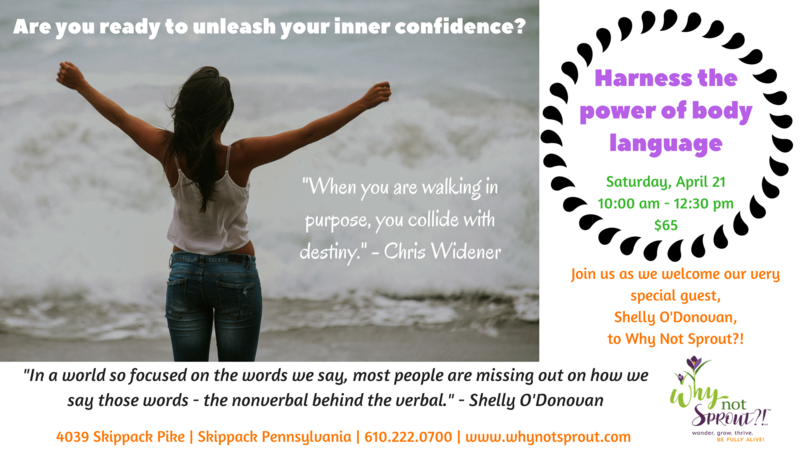 Call 610.222.0700 or email linda@whynotsprout.com to reserve your space! Registration closes at 4 pm on Sunday, August 26! 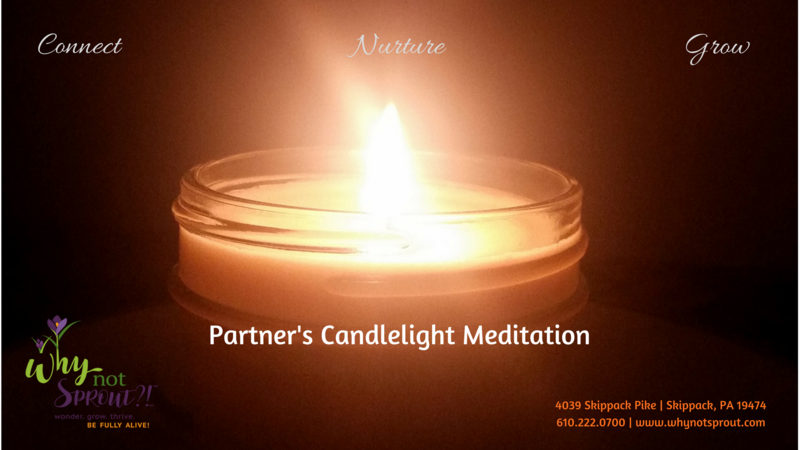 Partner’s Candlelight Meditation – Last chance for the summer on August 17! In our busy life, it is often difficult to create space for quality time with our loved ones. Nurture your connections; grow your relationship. You can use the link below to register in advance by August 16. This is your life – BE PRESENT FOR IT! Call or go online to RESERVE YOUR SPACE today! Mindful Walking Meditation – AUGUST 12 is being RESCHEDULED TO AUGUST 19. There is thunder and lightning in the air, and that is not exactly the kind of transformative experience we are hoping for! While we may not have sandy beaches in Skippack, the idea is the same! Join us on Sunday morning, August 19 at 9 am as we take a slow, deliberate walk through Skippack (off-road). We’ll be walking from Why Not Sprout?! to Church Road Park and back. As we walk, we’ll spend time paying attention to everything around us with intention – experiencing the sights, sounds, smells and touch of the earth (and hopefully the sun!). We will be mindful, grateful and appreciative of all that we have, and return to our day refreshed and invigorated. Want to know more? Call Linda at 610.222.0700 or email her at linda@whynotsprout.com. The cost is $15, and you can pay at the door. We need to know how many humans to expect, so please pre-register by calling or emailing Linda! We plan to keep the group to no more than 20 humans who are 18 and older. 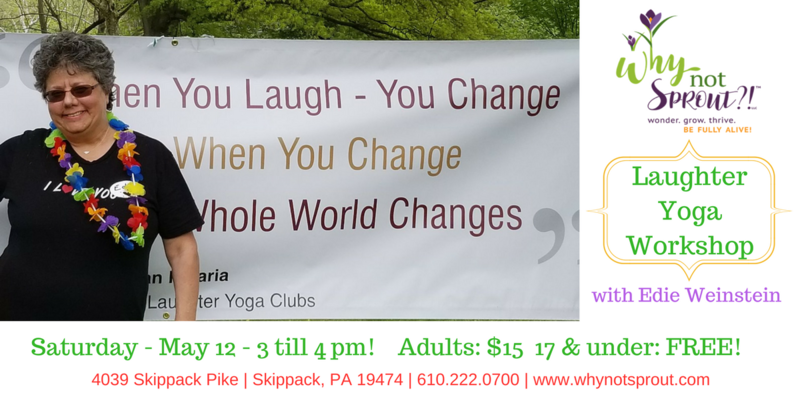 LAUGHTER YOGA IS CAME TO SKIPPACK! WE CREATED SOME POSITIVE VIBES TOGETHER! Laughter Yoga is a doorway into a world of wonder, a plethora of play, a bounty of breathing and a font of fitness. Have you heard of it? It’s not what you might think. It is not about getting all stretchy on a mat. There are no traditional yoga poses. You need not even have a sense of humor to engage in it. No jokes or comedy involved. Laughter Yoga is a practice in which creatively designed laughter exercises are combined with yogic breathing that comes from the diaphragm. It is considered light aerobic exercise that most people can do. Childlike playfulness and a willingness to be lighthearted are part of the process. Still want more information?? Click HERE! IMPORTANT NOTES:: FOLKS 17 and young must be accompanied by an adult; signed consents forms are a requirement for participation. 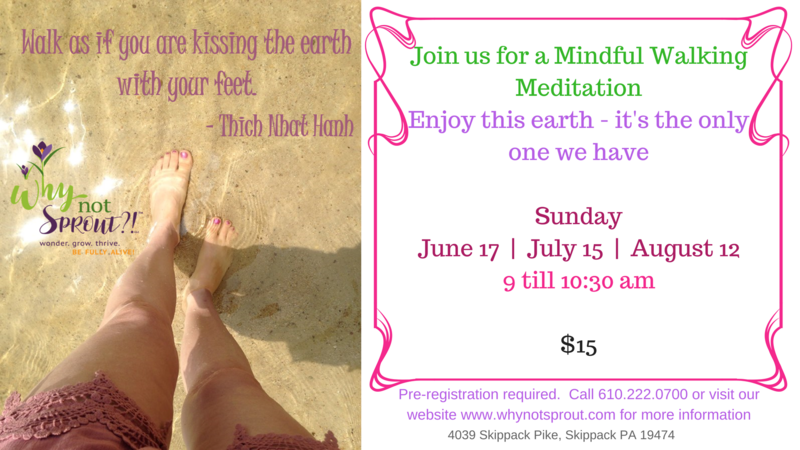 Call 610.222.0700, email linda@whynotsprout.com, or sign up online to reserve your space! Blurry lines and a masculine-dominated culture have created a need for women to unleash their inner confidence. In the dating world, the business world, or in social situations – women need to harness their “inner superpower” of body language. … all without saying a word! We’ll talk about attraction and distancing behaviors. We’ll explore which body language behaviors benefit us as women… and what works against us. Learn how you can revolutionize the way you present yourself, change the way you approach interactions and use your unique skills to become the best version of you! 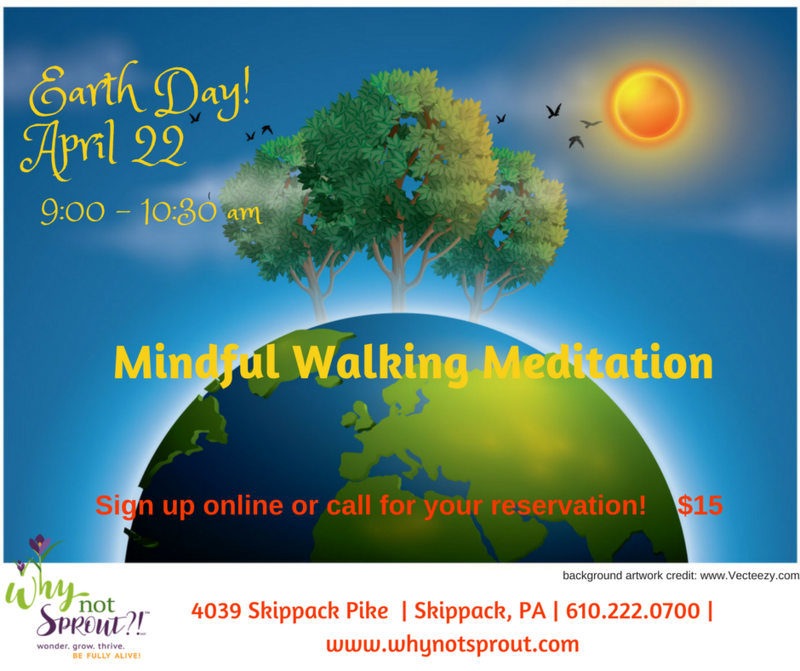 Join us for a slow and mindful walk, as we appreciate all that the earth shares with us. Meet at Why Not Sprout?! We’ll walk to Church Road Park and back (off-road), taking time to indulge all of our senses along the way as we offer gratitute and appreciation for all the earth offress appropriately for the weather. Pre-registration REQUIRED. It’s almost time to join the critters as they begin to wake up and welcome the new season! 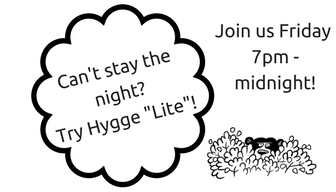 Stay all night – or make it “lite”! LIKE THE IDEA, BUT CAN’T STAY OVER NIGHT? Friday night, 7 till midnight! Includes everything up until sleep time! What the heck is a Hygge (pronounced HUE-gah), you ask? Are you feeling as if you’ve been living burrowed underground or asleep in a cave somewhere for the past few months? Or maybe you wish you HAD been hibernating? 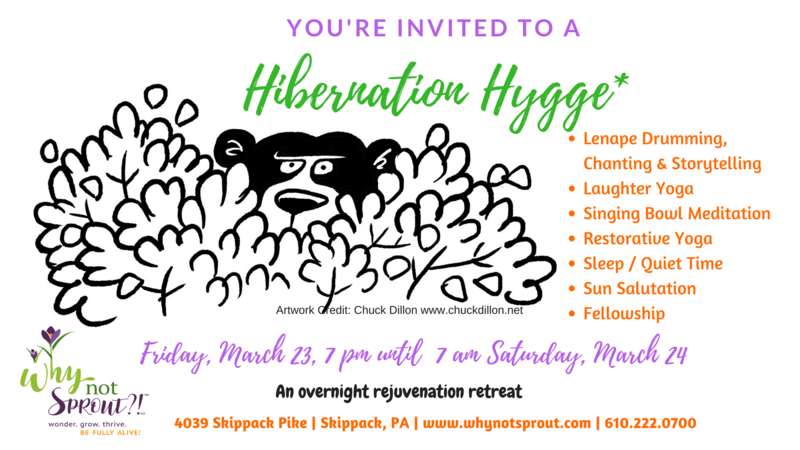 We’re here to help you prepare to come out of hibernation and re-enter the world refreshed and renewed with Skippack’s first-ever Hibernation Hygge – an overnight rejuvenation retreat. THIS IS YOUR TIME TO SIMPLY “BE” in the moment! Just as there is a calm pool at the bottom of a waterfall, there is a calm place within us all where healing occurs. A place deep in the center of our being that is unaffected by the rushing waters above. 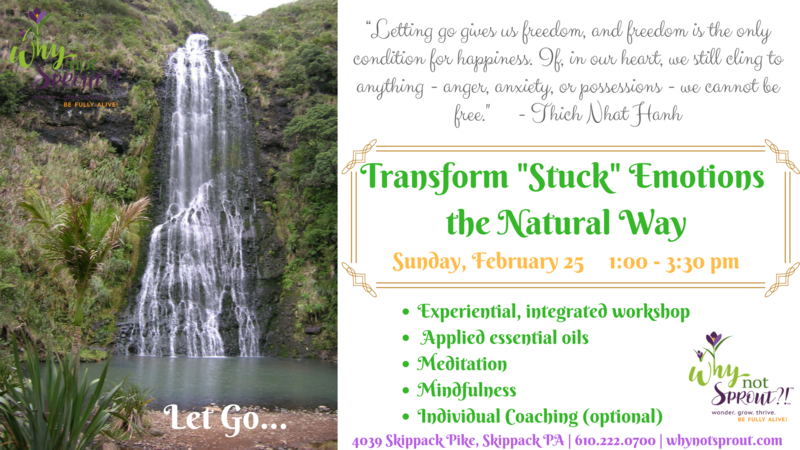 This experiential, integrated workshop includes applied essential oils with meditation and mindfulness strategies. You will be setting intentions, experiencing guided meditations, journaling about your experiences and sharing your obervations and insights when and if you feel called to do so. Wear loose and comfortable clothing; expect to be directed to apply oils directly on your skin during the workshop. Optional: Three follow-on individual sessions to support your journey… Because unexpected things can come up after workshops like this one, we want you to feel held, cared for and supported in the weeks following the event. You will have 2 months to use your sessions. This workshop is led by Beth Mathews, RN BSN HNC-BC from the Center of Integrated Health and Linda D. Wiesinger, BA Psych, CiPP, CCC from Why Not Sprout?! On Friday, October 27, I had the privilege of presenting one of our “Mindfulness You Can Use” programs at the Hospital of the University of Pennsylvania in Philadelphia as part of their Advanced Practice Providers week-long celebration. I want to thank the Task Force Committee (Melanie!) for the invitation, as well as all of the special practice nurses and physician assistants who attended our “Get your “but” out of the way!” workshop. THIS IS HOW SKIPPACK GIVES BACK! September was gynecologic cancer awareness month – and we came together as a village to dedicate Girl’s Night Out on September 22 to supporting this worthy cause! Why Not Sprout?! and 15 other Skippack businesses partnered with the Foundation for Women’s Cancer & Wendy’s Warriors to shine a bright spotlight on these less talked about “below the belt” cancers. 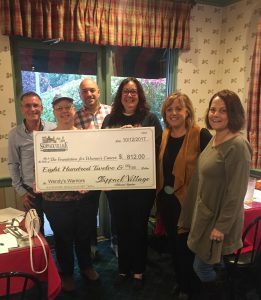 Through a combination of customer donations, shops donating a percentage of their sales, personal donations, along with gift baskets and gift certificates for raffling, SKIPPACK GAVE BACK in a most wonderful and generous way. Skippack Gives Back – – Pictured from left to right: Art Berger (The Wooden Duck), Wendy Ericsson, Drew Salamone (i76 Solutions), Linda Wiesinger (Why Not Sprout?! ), Deb Knight (The Copper Partridge) and Mary Bohidar (Accent on the Rocks). On Thursday, October 12, we presented Wendy Ericsson with a check for $812.00 for the Foundation for Women’s Cancer. I am feeling both proud and humbled by the outpouring of love and support, from my fellow business owners to every single customer that came out and shopped that evening.